It feels as if we have started the new season in a place of solid understanding and communication. We are hard at work on the first of two pieces that we will perform in the piazza of the High Museum of Art, a piece centered around the phrase (and the title of the work) "A home is a home is a home". 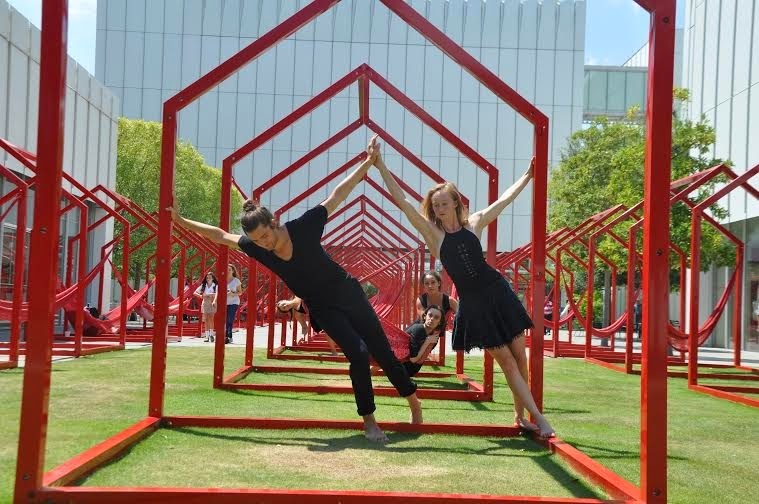 The piece will take place in the new public installation by Hector Esrawe and Ignacio Cadena here in Atlanta and then again in Arkansas in an installation by artist Peter Daugherty. We began our process with a stream of consciousness writing on the prompt "A home is a home is a home", picking words that stuck out to us and then developing movement phrases from one of these words. From the start I have been intrigued by the repeated movement ideas that have shown themselves through all of our individual work, revealing commonalities in our understandings of what home is. We rest our heads, we emerge from a small shape to a larger one, we feel chaotic, we put things in order. We have used similar processes in the past to devise work but while the process is the same it seems we have changed. We know each other more intimately than we did this time last year and it shows in the work. We can push ourselves in new directions, helping each other grow as artists. We can communicate in a free and easy way. We can help fulfill one another's ideas. I am beginning to see our processes as a series of riddles All of us trying to figure them out. All of us striving to reveal something beautiful. I am so lucky to get to work in this supportive group of artists and I am excited to see where this season takes us.